For much of Monday, the Explore Minnesota Facebook page was taken over by a hacker who posted bizarre stories on the page. 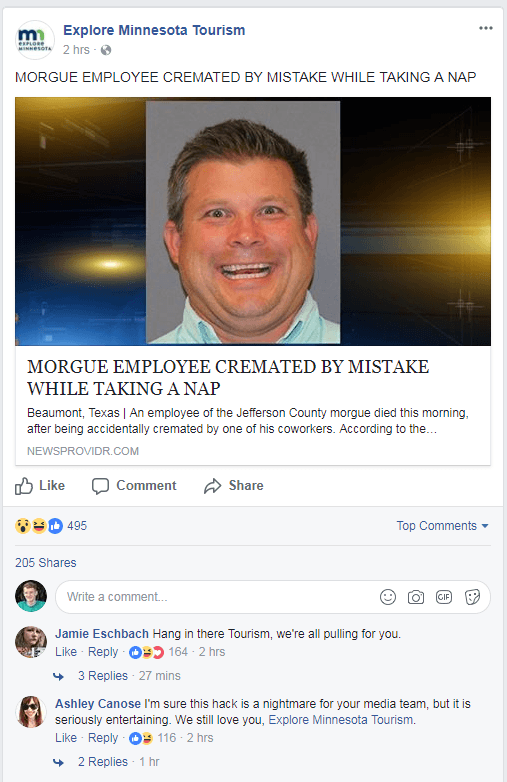 The state tourism bureau's social media site was filled with reports about everything from a death row inmate eating a Bible to a retired postman fathering 1,300 children. In short, the sort of tales you might see in supermarket tabloids. The hack was discovered at about 8 a.m., and was not stopped until about 4:30 p.m.
"We are not aware of who exactly the hacker is because Facebook is still investigating the situation. But we do know it is a random hacker," said Alyssa Hayes, a spokesperson for the tourism organization. Explore Minnesota's website and other social media outlets were not affected.